Countries around the world face a host of challenges; everything from national security to food security to problems resulting from climate change. India, in particular, faced many challenges after they were liberated from colonial rule in 1947 by the Indian Independence Act, passed in the United Kingdom's Parliament. Perhaps the most pressing of those issues, after the transition was over, was to feed their over 550 million people. At the time famine was rampant, so India embarked on what they called the Green Revolution, which was a movement towards much more intense and industrialized agriculture, employing genetically modified seeds, fertilizers, and pesticides/herbicides. The Indian government stepped in to make sure everyone was fed, importing massive quantities of grain, while also putting money into research for new types of wheat, grain, and maize. The late Vikram Sarabhai, then chairman of the Indian Atomic Energy Commission and the Indian National Committee for Space Research, notes that these new research varieties were imported from Mexico, Taiwan, and the Philippines, but that the flavor and texture did not match local palates. The new grains weren't a success, because they were found to be of inferior quality by local populations. However, once Indian agricultural research institutes genetically modified the imported grains to better match local tastes, he calls them a rousing success. He cites that "The first result of the application of these new varieties was that yields were doubled, and as soon as yields were doubled and the short-ripening varieties were available, multiple cropping became very much more extensive than it had been before. Production of food grains rose from a trend value of around 85 million tons to 108 million tons in a period of about five years. The result has been so dramatic that this year, 1971, instead of having a net deficit of food there is in fact a net surplus." (Sarabhai, p.8). That was the year of his death, and also the last year their food production rose significantly (Dasgupta, p.2). Additionally, this green revolution was a political choice and not a choice in the long term best interests of Indians. It had been known since World War 2, in India, that small holder farms were more productive than larger commercial ones, and that a more egalitarian land distribution would likely bridge the gap between food production and consumption, but reorganizing in such a way would "[hurt] the rural elite, the 'vote banks', who formed the backbone of the ruling party's support in the countryside", so they picked a different option – import new varieties from elsewhere and see if they can be engineered to local tastes (Dasgupta, p.2). The literature reveals that this solution, which maintained political structures as-is, depended on ever-increasing levels of agricultural inputs, and ended with even greater social inequality among Indians. Additionally, it had extremely detrimental environmental impacts, and was only beneficial to a few regions in India which were best suited to the type of agriculture the Green Revolution supported (Fujita, p.1). Even the regions which were once successful, are no longer, due to the damage sustained to the soil and environments (Zwerdling). Most of the literature is in agreement about a couple of points: initially the Green Revolution-style agriculture had a positive effect on productiveness of the regions where it was deployed, and that there were longer term problems that, depending on what the author's frame of reference was and what the time period in which they were writing was, became evident. These problems include social inequity issues, suicide from debt, poisoning by farm inputs, decreased agricultural productivity of the land, increasing necessity over time to use inputs (and in an increasing amount). The government response to these issues, thus far, has been to continue subsidization of the Green Revolution-style farming, and to double-down research money when something wasn't successful (as in the first round of rice crops that came out which nobody would eat). 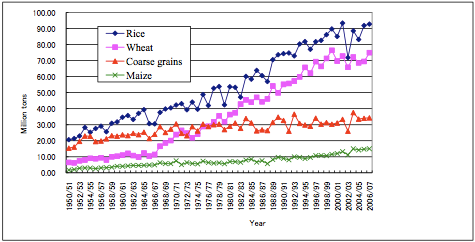 As you can see from this chart, wheat skyrocketed in production around 1967, which Sarabhai points out is exactly the year when the second round of engineering had been done to make the new grains more palatable for Indians (Fujita, p.5, Sarabhai p.1). When High Yield Varieties (HYV's) were introduced in 1965-6, there were fantastic productivity increases, from 72 to 108 million tons over 1966-1971, along with a decrease in imports from 10 million tons to 2 million tons over the same period (Dasgupta, 242). This was great, except for the immediately concerning part: it was only in wheat. As rice is the primary staple crop in India, if that gain isn't transferred successfully, it's going to be a huge problem. One aspect instantly brought forth by this is the question of who it was in India that could afford to invest heavily in growing a non-staple crop. It wasn't the poor farmers in problematic regions. The primary beneficiaries were large scale farmers or institutional farmers, and there were in fact significant barriers to entry for small farmers during this time period due to the cost of production associated with these new crops. This quickly fostered inequality worse than was already present, because the large and already reasonably well-off farmers were the only ones who could afford to invest in this new technology, and thus were the only group who could afford to profit off of it. This was countered, unsuccessfully, by the government by the creation of agencies like the Small Farmer Development Agency, which helped underprivileged farmers with loans and access to these new technologies. Even still, India saw these new seeds as 'Miracle Seeds' that would alleviate their food security issues. This wasn't just a little optimistic, it was nearly blind optimism. These seeds had only been around a few years, there was little experience using them, and during this time period the weather in india had been relatively stable. There had been no true tests of the new technology. This optimism was replayed again and again because, as it was claimed, with these seeds would come food security for India, and would thus remove them from the constant fear of famine and the dependency on (at the time) the US for food imports. There was fear that the over-productive nations (the US among them) could not sustain this level of productivity, or would falter, or would be subject to climate change, and then "wouldn't india be in a really bad situation?" This view drove the rapid deployment of industrial agriculture, as a way to gain food security. Production numbers from the time period strongly suggest that most of the food productivity gains were from regions that did not implement the new seed/chemical/irrigation combination. Punjab, the region which most heavily invested in the technology, only increased production by 100k tons in 1971, the bumper production year, whereas the other regions in India increased by a total of 8.3 million tons. At the time, the government attributed it primarily to good weather. From 1972 to 1975, there was nothing but bad weather and agricultural input shortages. During this period, productivity consistently declined, and by 1975 India was back to importing ~7.5 million tons per year of food (Dasgupta, p.242). 1976 saw another spike, a la 1971, also attributed to great weather by the government. To put all of this in perspective, "Taking the entire HYV period [1965-1976] into account, including the latest and the best year, the rate of growth in food production (at 2.5 per cent a year) is less than the historical growth rate during the pre-HYV period with a less advanced technology" (Dasgupta, p.242). So, economically, it seems like this new food production system is only marginally better than the old way of farming even in the best years, but brings with it many additional costs (inputs, ecological, social, lack of pest resistance). Culturally, this new system was problematic as well. It focused on a very packaged, very commercialized agriculture, which is exactly counter to what the cooperative farming movements of the time supported. The agricultural input distribution was done by selecting regions and farmers based on past performance, completely working around the institutional issues which existed as well as completely ignoring existing community power structures (Dasgupta, p.249). This works against communities because it removes some of their autonomy over their land – members of their villages are free to farm using these new inputs, which may be damaging to neighboring farms, but also because the selective system they were using ignores local power structures which are very important in any community. Labor was shifted dramatically by the Green Revolution shift in farming style as well. Due to the increase in mechanization of of ploughing, many less workers were needed. This, however, is stiffly countered by the increase in needed labor for the "application of fertilizer, weeding and harvesting," as well as the increase in double-cropping which requires twice as much or more harvest labor (Dasgupta, p.250). Also shifting is the family's participation in agricultural activities, which has sharply decreased. In richer families this is a problem because they ordinarily have house workers and farm workers on-site, but due to the intense labor needed for double-cropping, they often just hire labor temporarily instead of relying on those they have already. This means that even though the amount of hours of labor is going up, it's being done by fewer people, and they're hired hands instead of community members, or women, or older people. This has the side effect of cutting out a lot of women from the farming process. Also, because only some regions of India were adopting the new technology, some displaced workers began roaming around as hired hands during harvest seasons, much like the migrational labor seen in California. An explanation that ties all of this together is given by Ladejinsky, wherein he posits that the sum of these problems are this: the technology has come in and destroyed, where used, the cultural, political, and economic systems that have existed for a long time. He suggests that what has happened is that this re-orientation of Indian society, based around market approaches and efficiency, have resulted in the ending of cultural practices which were wasteful, but which supported the entire lower echelons of society, and that the uneven distribution of this technology (quite purposefully, too) has resulting in an increase in the distance between rich and poor, as well as migrational labor patterns not previously seen in India (movement which destroys local culture and power structures, of course, because the people aren't there to participate in them). Most of the authors believe that this Green Revolution had some positive effect. However, like Dasgupta, 3 of the 4 cited previously see serious shortcomings in the Green Revolution approach. The model of agriculture adopted during the green revolution does not differ significantly from current commercial industrial agricultural systems. It was the initial adoption and deployment of genetically modified seeds, chemical inputs such as fertilizer, insecticide, and herbicide, and the mechanization of agricultural processes via gas-powered machinery in India. The ecological impact is similar. It has increased greenhouse gas emissions, poisoned the environment with insecticide, fungicide, and herbicide (Pingali, p.3). Water usage has skyrocketed due to increased farming intensity (without significant increases in overall productivity), and in more modern times the productivity is actively declining, leaving farmers in debt and without usable soil (Zwerdling). "Unintended consequences in water use, soil degradation, and chemical runoff have had serious environmental impacts beyond the areas cultivated", and that's from a Gates Foundation paper (Pingali, p.3). One of the agrochemicals commonly used throughout India, Endosulphan, has been found to cause birth defects in men by an NIH study (Saiyed). The Green Revolution farming is, in some places, driving down the water table by 3 feet each year (Zwerdling). This makes the water almost unattainable to farmers, as only the richest can afford to buy newer and better pumps every year or two so they can still pump out water to irrigate their fields. As we have learned from Cuba's example, it takes around 4 to 5 years to regenerate the soil after a farmer ceases chemical use, so if India attempts a conversion (because the current way is not sustainable), it will be very painful. Additionally, as the focus of Green Revolution agricultural technique use has been on the best land, that which can produce the most, or is already irrigated and has a favorable environment, this is also the land which is being destroyed the fastest. India is or has destroyed the best land they have by soaking it in chemicals that take half a decade to work out of the soil. The relevance this has for climate change is clear: with mechanization and chemical use come increased greenhouse gas emissions. It's all oil, and as we learned from Vandana Shiva's Soil Not Oil, oil is driving the triple crisis of food, fuel, and climate. These are not different issues, they are the same, and the solutions are the same too. India's solutions to these problems will be the world's solutions. They are one of the most populous nations on earth, and they could lead the world in experimental agriculture. I think the key point here is that we're suffering a lot of crises, and they seem to be piling on faster and faster, and somebody's got to do something about it all. I think India can be that somebody for agriculture. Non-oil-based agriculture is cheaper and less wasteful of earth's resources, it doesn't poison the soil, and it doesn't cause runoff that poisons fields unassociated with these farming techniques. If the largest farming nation on earth could cut out all of the greenhouse gas emissions being created from oil based agriculture, that would significantly decrease the amount being emitted. 1/3 of all greenhouse gasses are agriculture related, so this would be a not-insignificant amount. Additionally, this would lead the world in that direction, decreasing by example the greenhouse emissions of all other nations on earth. That would be an important step forward in global agriculture. It would also do much to start turning back the clock on the destroyed soil we cannot use any longer due to chemical poisoning. I don't have any realistic recommendations to solve these problems, and neither will anyone else until they realize capitalism is driving us down this road. The absolute best we could do, with the current system of oil agriculture, is to make everything use less oil, emit less greenhouse gasses, and start genetically engineering seeds for drought resistance instead of fertilizer uptake. Those would be very good steps forward for the short term. Longer term, we should visit ideas presented in Soil Not Oil, such as food and seed soverienty, or a large scale build-out of the small-holder organic agriculture introduced to us by example in Cuba: Unfinished Puzzle. Seed Sovereignty also provides a few good pathways for moving forward in the current system (until we can bootstrap a new one), ideas like open source biology, and BioLinux of seeds, where we use current well-tested legal mechanisms to force some of this cultural knowledge into a commons created within that legal framework. Those are all very good first steps, and if we took more than one of them the world would immediately change for the better. If we kept walking, we'd get to find out how much for the better. Almost all of the solutions that could remedy issues explored here would involve a reduction or elimination of oil from agriculture. It would assist with the meta-issues of climate change and energy crises, and the smaller scale problems such as poisoned waterways and destroyed topsoil. This idea is explored at length in Soil Not Oil, and would involve significant, but necessary, structural changes to the way we do things currently. Education would help all of this, but that's also exactly what the Gates Foundation found to be the problem with India's Green Revolution, they blamed it almost squarely on people being uneducated about how to implement the agrarian reforms, that the government was subsidizing the chemicals when it shouldn't have been, and that the farmers were applying too many (Pingali, p.3). This, of course, is pure irony, as it completely ignores how fundamentally broken the Green Revolution is. However, I will put one solution forth. It's a first step. I want to see La Via Campesina's work everywhere. That would do a great deal to help. Farmers would be educated, as well as knowledgeable about the tools they're using, when and where they can be used, and how they can convert to organic agriculture themselves without endangering the livelihood of their family. If we combine the identity politics and organic farming of La Via Campesina with global north nations fighting on behalf of our own farmers so that they have seed sovereignty, and we enforce through legal action these open source seedgerm ideas put forth in Seed Sovereignty, we as global north peoples could do our first step to help. Eventually we'd have to change our own culture and consumption patterns, but I, as a lowly college student, cannot lay out that template. I do not think that solution will emerge within my lifetime, but we can start on these other things now. They will make a measurable difference now, and later, and lead to the future where other people are put in the position of figuring out that last 10% to get to an equitable and just future, with honor and love for all campesinas. Dasgupta, Biplab. "India's Green Revolution." Economic and Political Weekly 12 (1977): 241-60. Print. Fujita, Koichi. "Green Revolution in India and Its Significance in Economic Development: Implications for Sub-Saharan Africa." (n.d.): n. pag. 2010. Web. 17 Dec. 2013. Hazell, Peter. "Green Revolution: Curse or Blessing?" International Food Policy Research Institute, 2002. Web. link. Ladejinsky, Wolf. "Ironies of India's Green Revolution." Foreign Affairs 48.4 (1970): 758-68. Print. Pingali, Prabhu L. "Green Revolution: Impacts, Limits, and the Path Ahead. "Proceedings of the National Academy of Sciences of the United States of America(n.d.): n. pag. 23 July 2012. Web. 17 Dec. 2013. link. Sarabhai, Vikram. "India And The Green Revolution." Bulletin Of The Atomic Scientists 28.7 (1972): 8-10. Academic Search Premier. Web. 17 Dec. 2013. Saiyed, Habibullah, Aruna Dewan, Vijay Bhatnagar, Udyavar Shenoy, Rathika Shenoy, Hirehall Rajmohan, Kumud Patel, Rekha Kashyap, Pradip Kulkarni, Bagalur Rajan, and Bhadabhai Lakkad. "Effect of Endosulfan on Male Reproductive Development." National Center for Biotechnology Information. U.S. National Library of Medicine, Dec. 2003. Web. 17 Dec. 2013. link. Zwerdling, Daniel. "'Green Revolution' Trapping India's Farmers In Debt." NPR, 14 Apr. 2009. Web. 17 Dec. 2013. link.